Arlie M. Skov, 87, passed away December 23, 2015 at his home in Santa Barbara. Arlie is survived by his wife, Luella L. Skov, of Santa Barbara, CA, three children, Gregory M. Skov of Austin TX, Jeffrey M. Skov, of San Luis Obispo, CA, Tamara K. Skov of Santa Barbara, and seven grandchildren. Skov was born September 21, 1928, in Noble County, Oklahoma, the eldest child of Arnold and Mary Skov. He married Luella L. Sloan, a native of Noble County, Oklahoma, on July 31, 1951, in Stillwater, Oklahoma. His education began at Oak Grove School, a traditional one-room eight-grade country school east of Perry, Oklahoma, from 1935-46. He attended college at the University of Oklahoma and graduated with a BS degree in Petroleum Engineering in 1956. 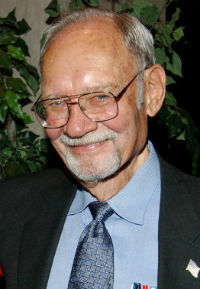 Skov’s military service included three years in the Oklahoma National Guard from 1948-1950, and active military service in the U. S. Army Corps of Engineers, 1950 to 1952. Following graduation from the University of Oklahoma, Skov began a 36-year career in petroleum engineering and management, initially with Sohio Petroleum Company in Oklahoma City, and later with various subsidiaries of British Petroleum including BP Alaska and BP Exploration, in California and Texas. In 1974, his job focus shifted to the north slope of Alaska and the huge Prudhoe Bay oil and gas field. In 1981, he became Manager New Technology Development. In 1983, Skov was appointed Director Production Technology in Dallas responsible for Research and Development and technical services for all U. S. oil and gas production operations for British Petroleum. Skov was active in technical and professional societies including SPE (International Society of Petroleum Engineers), AIME (American Institute of Mining, Metallurgical, and Petroleum Engineers, one of the Five Engineering “Founder Societies” in the U. S.), and API (the American Petroleum Institute). Skov and his wife traveled extensively from 1990 to 1992, including many trips to Europe, South America, Canada, the Middle East and also to Russia, Australia, and China. After retirement from BP in 1992, Skov formed Arlie M. Skov, Inc., Petroleum Consulting, based in Houston, which remained active through December 2000. He was a registered professional engineer in Oklahoma and Texas, and lived in Santa Barbara, California, where he and his wife moved in 1995. A funeral services will be held at 2:00pm on Saturday, January 30, 2016 at First Presbyterian Church of Santa Barbara. (www.fpcsb.org) Graveside rites will be held at Pleasant Valley (Sumner) Cemetery, Noble County, Oklahoma at a later date. In lieu of flowers, donations may be sent in Skov’s memory to the Santa Barbara United Way (www.unitedwaysb.org) or the charity of your choice.